Wilfrid Laurier University Faculty of Music student Camellia Bissessar will make her long-awaited walk across the convocation stage on June 14 to receive two honours – her Bachelor of Music (BMus) degree and the 2018 Laurier Student Teaching Award of Excellence in the undergraduate category. 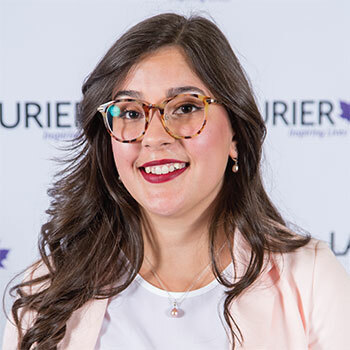 Bissessar’s score of accomplishments over her four years at Laurier highlight the impact of student leadership as part of teaching and mentorship. As an educational assistant with the Accessible Learning Centre (ALC) during the 2017/18 academic year, Bissessar worked with two Faculty of Music students with visual impairments. A typical week included attending classes with the students, taking in-class notes, transcribing workbook material, and providing additional tutoring as requested. Using a large magnetized board, Bissessar arranged magnetic notes to effectively show the students – one with low vision and the other with no vision – the musical notations or concepts being taught. On other occasions, Bissessar rewrote key terms or filled staff lines on larger poster boards, enabling the students to see and interpret the course notes. Often, Bissessar needed to describe the musical sequence written on a whiteboard verbally to students, or detail the hand placement of an instrumental chord that was played by the instructor. Although she did not study in the same performance areas as the students she worked with, making many of the course concepts foreign to her, Bissessar was keenly aware of the greater challenges facing the students, and took a holistic approach to the job. Riggin notes that, although there are technologies available to assist students with auditory and visual impairments, peer-based educational assistance is still key. Driven to become a teacher from a very young age, Bissessar’s passions for teaching and music intersected in grade eight when she held the lead position on her school’s music council. She began playing piano at age six and took up the trombone in middle school. By high school, Bissessar wanted to begin playing the saxophone. By grade 11, she was practising flute regularly during private lessons and in grade 12 she auditioned with her flute for Laurier’s Faculty of Music, one of the most competitive instrument auditions at the university, says Bissessar. She was accepted to the program and chose to pursue the music education stream, one of the many diverse undergraduate pathways available. Today, under Bissessar’s leadership as co-president of the Laurier Students’ Association of Music Educators (SAME), the university group has coordinated conferences and community outreach initiatives dedicated to expanding the reach of music education beyond the campus and into the community. In 2016 and 2017, Bissessar developed and delivered multi-day music workshops for the Junior University Multidisciplinary Program (JUMP) that saw several local elementary school students fully immersed in the university experience at Laurier’s Waterloo campus. “I became involved in JUMP because I wanted to grow in my teaching practice,” says Bissessar. In May 2018, the elementary students returned to campus, and so did Bissessar – in a leadership role as a JUMP music coordinator.